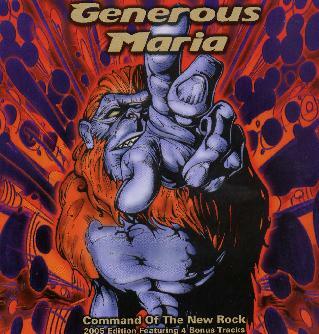 Generous Maria - "Command of the New Rock"
This CD was released in 2002 on the Swedish Lunasounds label but is now being reissed. The Swedish band will go out on the road in Europe to support this reissue on the Belgium label, Buzzville. This reissue packages extra tracks from the bands rare 7" records and compilation only tracks, so if you like this Swedish bands groove, you get a bonus here. These guys really rock and I like the way the singer sings and expresses himself. This CD has some great tracks on it and if you like Swedish style stoner rock you can't go wrong here. Heavy and melodic with grooving guitars! For more information you can visit the Generous Maria web site at: http://www.generousmaria.com. Visit the Buzzville Records web site at: http://www.buzzville.be.